This 2 bedroom and 2 bath home invites comfort and exudes modern elegance. 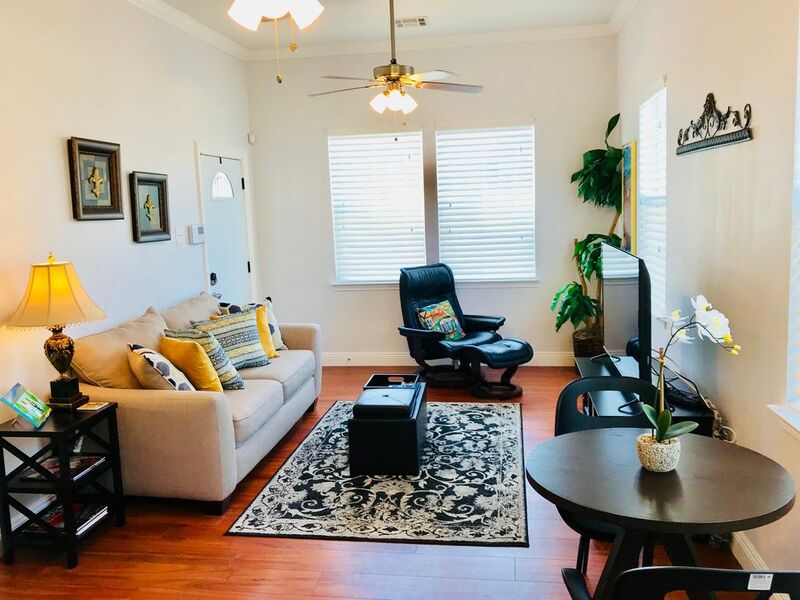 There's plenty of natural light flow throughout with such modern amenities as granite countertops, new appliances, washer/dryer, WIFI, security system, and private deck. fully equipped, luggage racks in every room closet, robes, iron/ironing board, blush towels, high threads sheets, clocks/USB, hair dryers in bathrooms, and much room. You'll also love the convenience of your own off-street parking. It's only a few minutes from New Orleans attractions. I’m currently the CAO of St. John the Baptist and was a former staffer of a member of Congress. I’m very involved with a number of civic organizations locally and nationally. I’m a runner, cyclist, wife, mother (4) grandmother (4) and interior designer (hobby). We had a lovely time, only suggestions is higher toilet as our husband are over six feet. We thoroughly enjoyed staying at this home. It was perfect for two couples. We each had our own space and bathrooms. The items provided in the home were above sufficient for the week. We thought the home was placed within good distance of the tourism sites, but far enough away that we could get away when needed. The neighbors were nice, saying hi and even helping when a wind/rain storm came through. Thank you, LaVerne and James for the stay. We would definitely use this or at least ask to use this home if we plan on returning to the area in the future. This is a really nice place for a couple, or single parent with children. The house is very clean, well decorated and so cozy. TVs in both bedrooms and front room. The hostess/host are gracious and go the extra mile to make sure your stay is a grand experience. Imagine my surprise when I found wine, king cake, and a goody bag for us to enjoy, even had umbrellas and canvas chairs for the Mardi Gras parades. Shelves are well stock and seems like they think of everything you might need. I had troubles with security alarm and they were very understanding and returned calls or text immediately. I highly recommend this place and would stay there again if I ever return to New Orleans. Very clean, comfortable. It was 200% prepared for our visit. Anne and Leo, you were the BEST! I'm glad you had an awesome in our one of kind city and the property. We definitely look forward to hosting you again in the future. Safe travels and thank you!